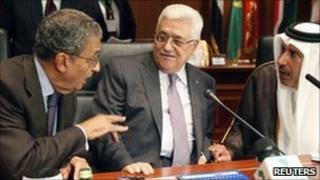 Arab League foreign ministers have given the US one month to rescue deadlocked Middle East peace talks. At a meeting in Libya, they endorsed a decision by the Palestinian negotiators to stay away unless Israel restored a partial settlement construction freeze. But the ministers said the US had to be given more time to break the impasse. The direct negotiations, the first in almost two years, resumed in September but later stalled when Israel refused to extend the freeze in the West Bank. While at first glance the Arab League statement may look like the last rites for the peace process, in many ways it represents a significant victory for US efforts to keep it alive. When this meeting was convened, many expected the League to endorse the Palestinian position and declare the talks over. But, anxious to breathe life into a process that has long resembled a corpse, the US cajoled Arab leaders to come up with a solution that could buy them, and the talks a little bit more time. It worked. While supporting the Palestinian stance, the League said it would reconvene again in a month - during which the US would again try to find a compromise. The State Department was certainly grateful. But while it may have avoided a dry, dusty death in the Libyan desert the whole process is still in peril. Israel's prime minister has so far resisted international pressure to reinstate a construction freeze. But that does not wash with the Palestinians. The prognosis is not good and over the next month the Americans will again be hard at work if they are to pull this one out of the bag. Palestinian Authority President Mahmoud Abbas attended the meeting of Arab League foreign ministers in the Libyan city of Sirte. Afterwards Qatari Foreign Minister Sheikh Hamad bin Jassim bin Jabr al-Thani, who chaired the meeting, told reporters: "The committee endorses the decision of President Abbas to stop the talks." "It urges the American side to pursue its efforts to prepare adequate grounds and circumstances to resume the peace process and put this peace process back on the right track, including stopping settlements," he added. The Arab League ministers are now due to meet again in a month's time to review the situation. The US state department later said: "We appreciate the Arab League's statement of support for our efforts to create conditions that will allow direct talks to move forward." Israeli Prime Minister Benjamin Netanyahu has refused to extend the 10-month ban on settlement building in the West Bank which expired on 26 September. Many countries, including the US, had urged the Israelis to extend the freeze. Close to 500,000 Jews live in more than 100 settlements built since Israel's 1967 occupation of the West Bank and East Jerusalem. They are considered illegal under international law, although Israel disputes this. Are you in the Middle East? What is your reaction to the current state of peace talks? Send us your views using the form below. In most cases a selection of your comments will be published, displaying your name as you provide it and location unless you state otherwise. But your contact details will never be published.